There are several environments where I feel at home and lowland heath is one where I prefer to spend the height of summer. Long considered to be of poor agricultural use, this hasn’t stopped our lowland heaths from disappearing under the bulldozer to make way for housing. The once-bountiful swards which straddled the Avon, Moors and Stour Valleys have mostly been consumed by the conglomerations of Poole and Bournemouth, with only the margins and a few lonely pockets remaining. 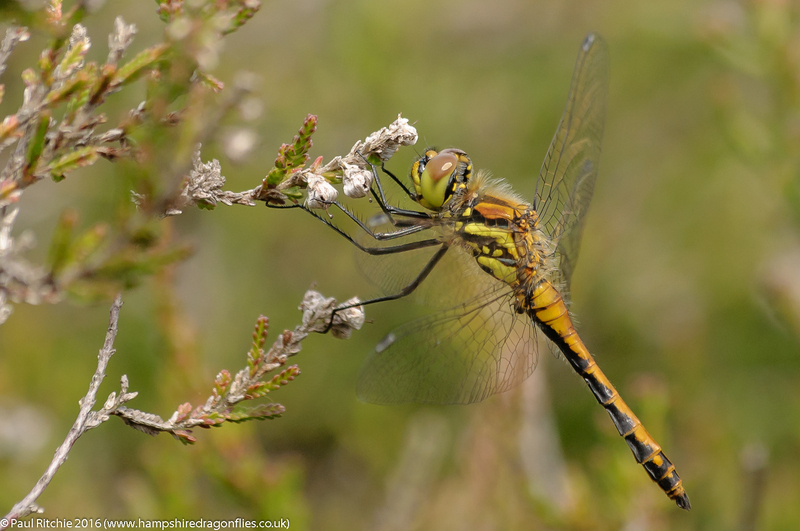 Thankfully the New Forest to the east and Studland to the west have escaped the onslaught and are for the most part protected, being a vital ecosystem for many of our heath-land invertebrates, reptiles and birds. Town Common near Christchurch is a prime example and has been a real favourite of mine over the past few years; the myriad of ponds making this a mecca for dragonflies. Ironically the majority of these ponds are man-made with the help of those usually-destructive bulldozers. 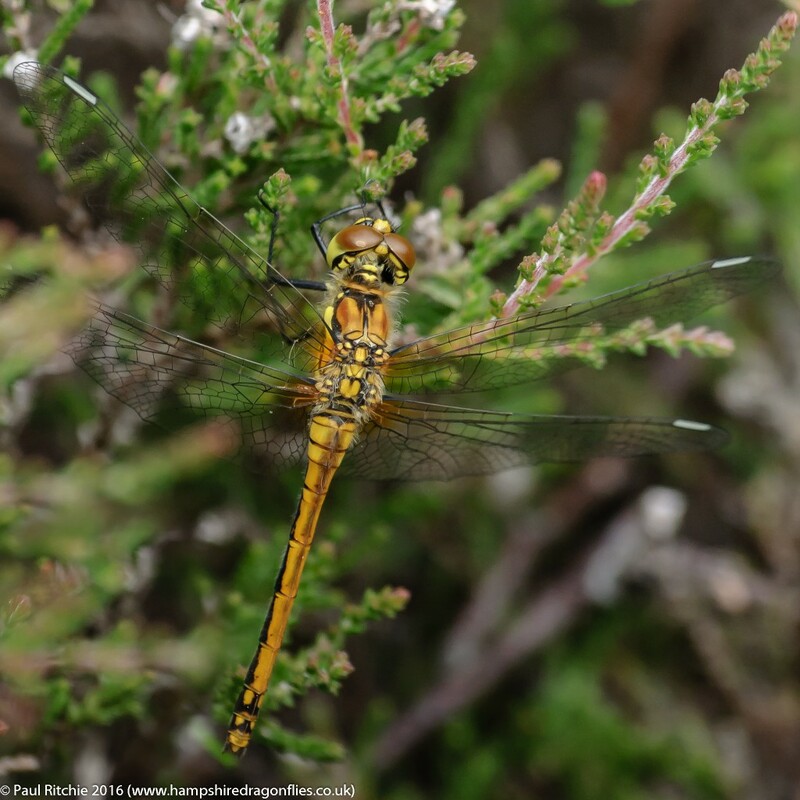 The management of Town Common and the adjacent Ramsdown Forest is undertaken by the Amphibian and Reptile Conservation Trust (ARC) for the benefit of our native reptile fauna, to which they provide a sterling service to our dragonfly fauna as odonata are a major menu item for the Sand and Common Lizard. A perfect example of sympathetic conservation working to preserve a mutually beneficial environment. 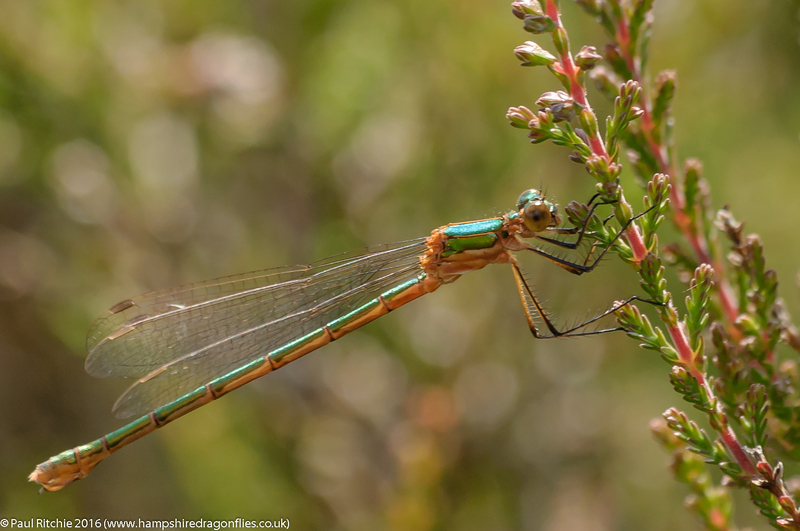 On a sunny day the ponds are alive with odonata, including our summer heath-land triumvirate of Black Darter, Common Emerald and Small Red along with the more common Azure, Common Blue, Chasers, Darters, Skimmers and Emperors. 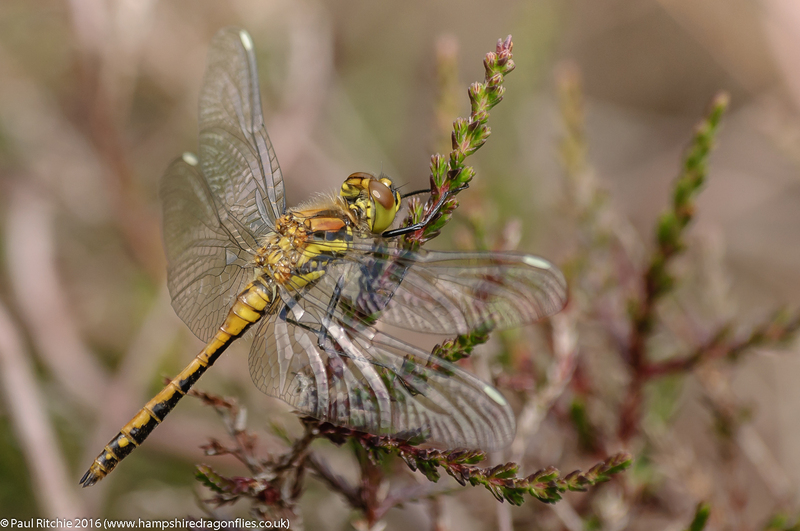 It is also one of the environments where you can find the locally-rare Moorland (Common) Hawker while the surrounding heath provide refuge for the Scarce Chaser, Golden-ringed and Brown Hawker which breed along the adjacent rivers. It is truly one of my great favourites, not least for the relative isolation, associated quietness and the ability to get lost enjoying uninterrupted solitude indulging in the fauna. 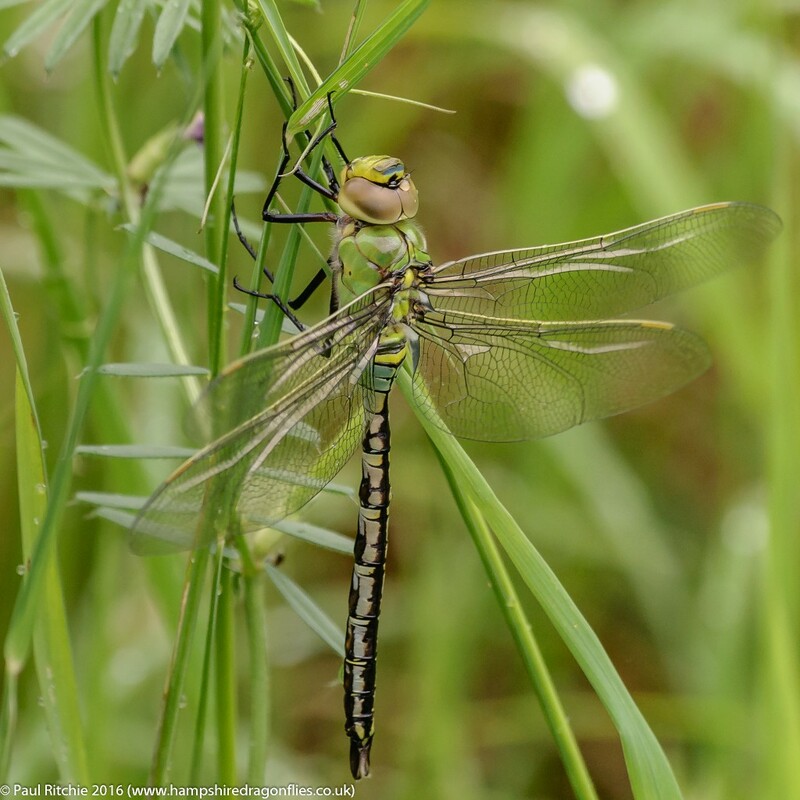 So here’s to Town Common and Ramsdown for providing an optimum environment for our heath-land dragonflies. Other conservation organisations can learn a lot from their sympathetic management. 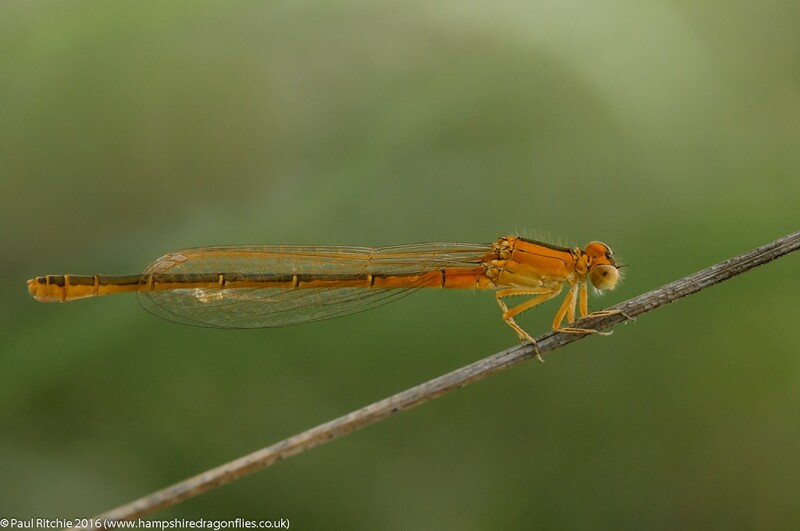 There is obviously a bucket list for Odonata; usually the rarest, most local or migrant speciality like the Lesser or Vagrant Emperor, the Red-veined Darter, the various Emeralds etc. Yes, it’s a ‘tick’ to get these species, but in the case of migrants or rarities I find it far more enjoyable to encounter them by being at the right place at the right time. 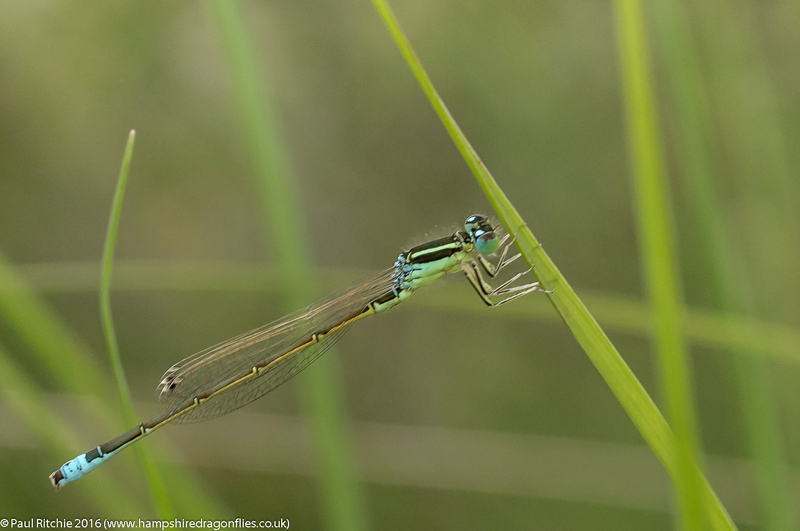 One of these rare species is the Scarce Blue-tailed Damselfly, which is a native of our Isle. What makes them rare is their exacting habitat requirements, although with stories of colonising shallow tractor/bulldozer/motocross tracks they are opportunistic. 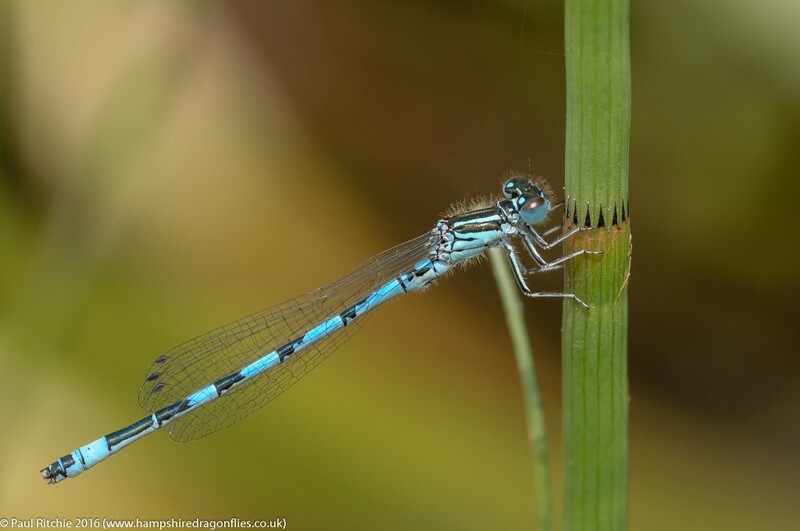 There is no doubt that the best environment to experience this jewel of the damselfly species is in their preferred natural habitat; usually boggy flushes with healthy water quality and vibrant emergent vegetation, especially Water St. John’s Wort. 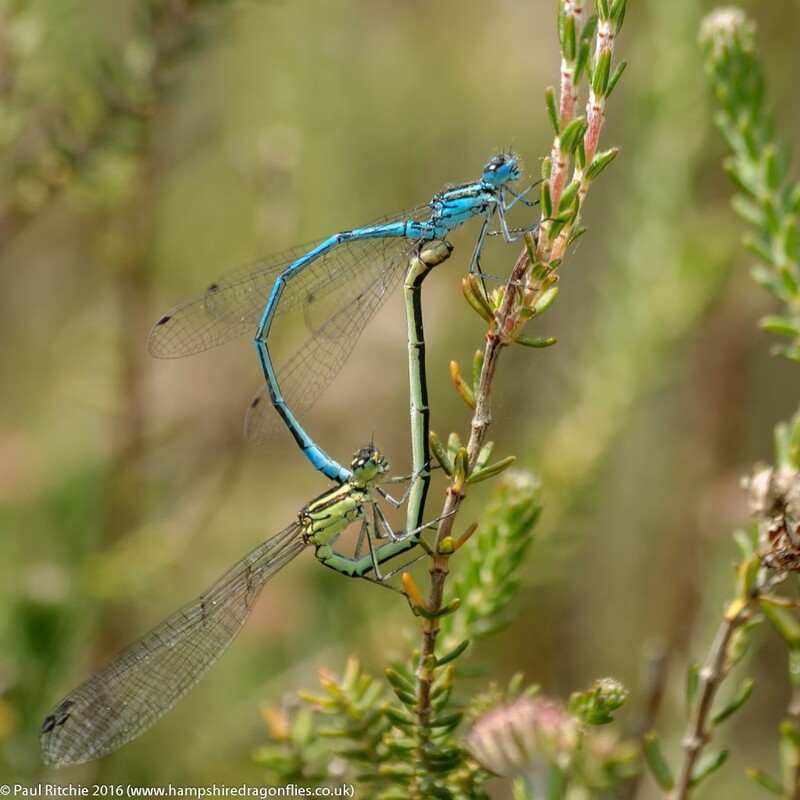 In the New Forest we are fortunate to have a few perennial breeding populations. 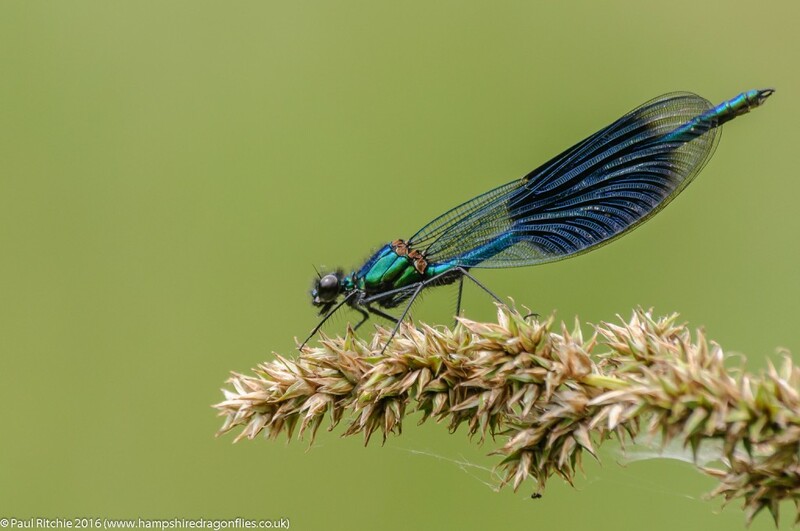 There is a small colony along the Ober Water where you may be lucky to spot up to half-a-dozen on a good day, but by far the best location is the boggy flushes straddling Latchmore Brook. A Scientific survey a few years ago counted thousands. It took me a few years to pinpoint the key area ,despite several clues, and perhaps quite-rightly the exact grid reference was left vague. This is a good thing, because the last thing this species needs is a herd of bucket-listers congregating on-mass and destroying their habitat. Naturally I always look forward to my first Latchmore foray, full of hope and often disappointed, but the good times out-weigh the bad, with several successful excursions over the past few years. 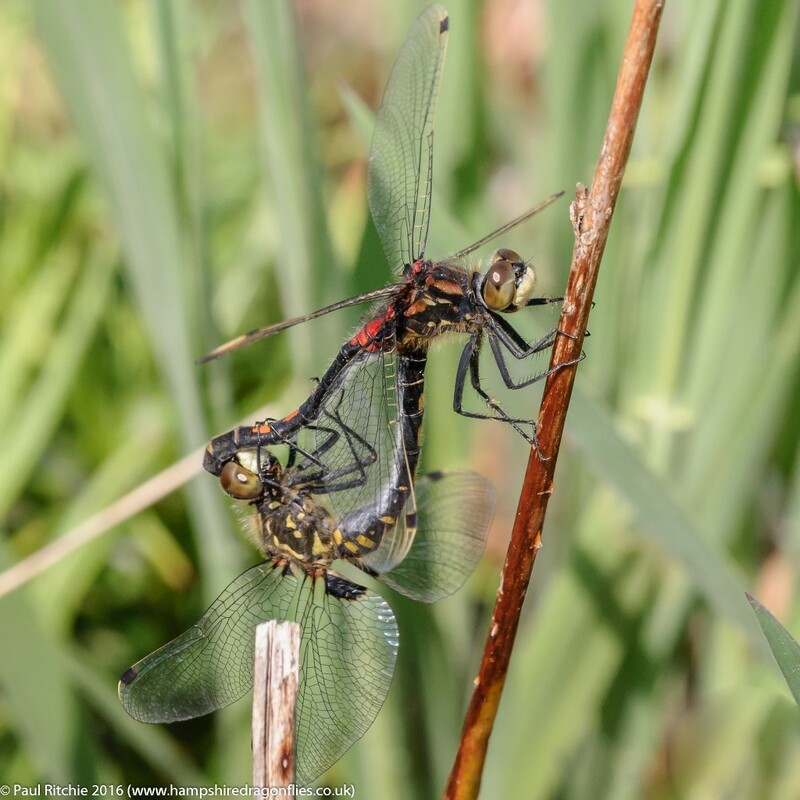 It’s a tranquil place when the sun isn’t guaranteed; and although a sunny day can offer the best dragonfly action, the hoards of picnickers and dog walkers can distract on a hot day during the high season. Thankfully the tourists stay reasonably close to the car park. Sometimes too close. Never understood why someone should travel miles to picnic a few metres from their car? However this is to our advantage, and provided you are willing to walk that extra mile you can be in a natural paradise with plenty of birdsong guiding you to peace. 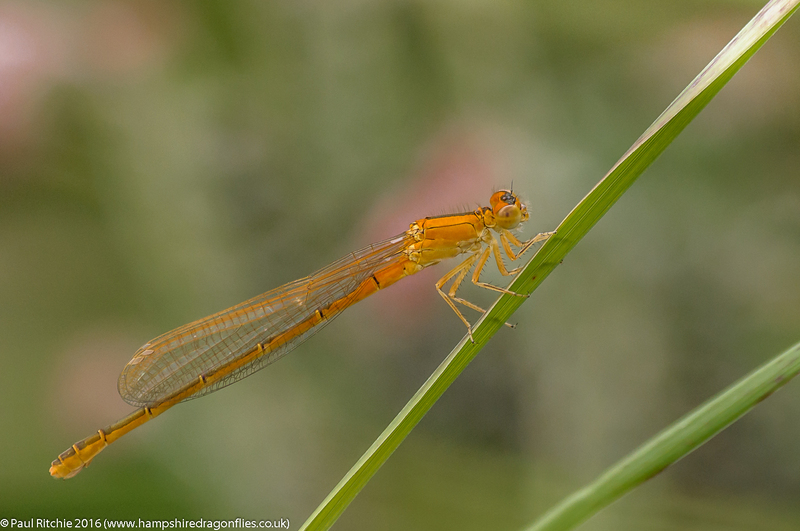 The ‘aurantiaca’ phase of the female Scarce Blue-tailed is quite-rightly considered a prize among dragonfly aficionados; the vibrant immature orange tones being entirely unlike any other damselfly colour form. A beautiful sight in stunning prom dress before maturity turns her into a quite drab matt green fully-formed adult. 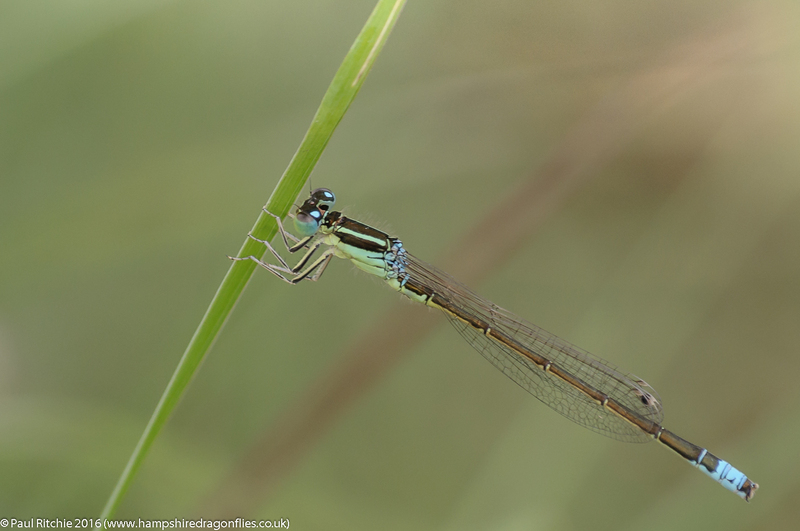 However it is important to appreciate this special little damselfly in all its stages. The mature males out-shine their mates in glorious technicolor yet themselves are a little drab to begin with. Drab or not, encountering an immature male is a first for me, likewise the freshly-emerged female. During an enjoyable two days the only stage I didn’t encounter was the quite beautiful transitional phase from orange to green, but their season has only just begun. After five days stuck under a period of low pressure I took a gamble on Wednesday, and was glad that I did so. 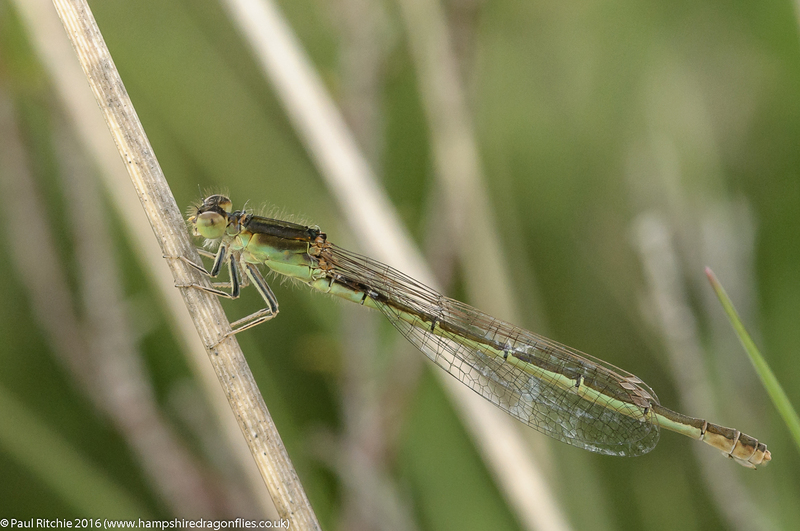 Despite threatening cloud and strong gusts I had an agenda; to find me some Common Emerald and, if lucky, a Black Darter. 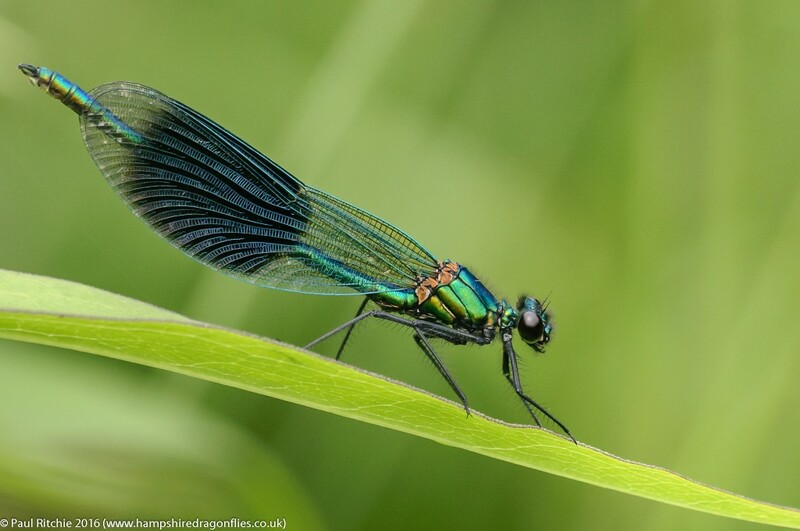 The Emeralds were easy to find; exactly where they should be, although staying low out of the breeze and not as many as I expected. Even harder to pin down were the Small Red. Once they rose they disappeared, seemingly into another dimension. 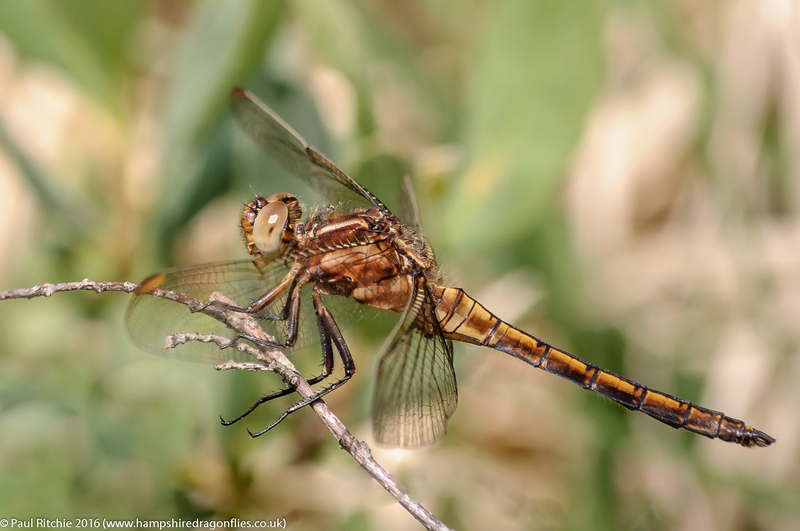 The welcome sight of a few Scarce Chasers kept me on my toes, and, despite their citrus appearance, they were also hard to follow once they caught the breeze. 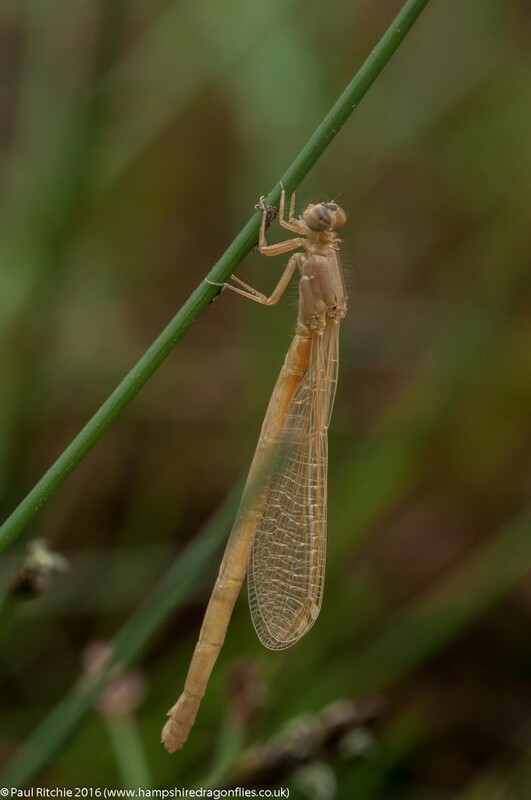 A false alarm as the unmistakable shape of a Darter rose, the size alone determining it as a Common. Still, that’s four species in a short while under challenging conditions. Naturally the ponds were devoid of any activity, so I took a stroll along the tracks hoping I might find a roosting Hawker, but not today. No worries, the discovery of yet another pond I’d somehow managed to miss before kept my spirits high. A cracking little pond it is too, for it was here I finally caught up with the Black Darter. I almost missed it. The unmistakeable shape of an abdomen made me look twice. So well was she hidden down low in the heather that It made me question how many more I’d missed. This find had given me a little boost of energy so I carried on under some brief sunshine before heading over to Ramsdown. Nothing of note here so should I dare attempt Troublefield? After all it is mid-June and the cattle are bound to be present. Present they were, but thankfully in the top meadow where they should be. The key meadow was devoid of bovine presence and the gate was still unlocked, although there were some flattened areas which looked distinctly mammalian. On the whole though it was pristine, tall grasses and reeds, beautiful wild flowers and the skies were alive with insects in this little sheltered paradise. The winds couldn’t penetrate here, and those brief moments of sunshine kept the temperature warm & humid. Banded and Beautiful Demoiselles were present in large numbers but it was the Scarce Chasers which impressed. At least twenty-five individuals added welcome colour and contrast in this sea of green. This is the most I’ve ever seen here, and is no doubt due to the meadow being allowed to develop. The sheer number of feeder insects and unrivaled shelter makes for a fabulous refuge, although I could do without the horseflies which certainly made a feast of me. Horseflies aside, a very pleasant hour to round off the day nicely. In my opinion if you’re not prepared to experience the discomforts of nature you certainly don’t deserve the benefits. Continuing the need for solitude a visit to the New Forest was long overdue, so on Thursday I took a stroll along Ober Water to add a few species to the season’s count. 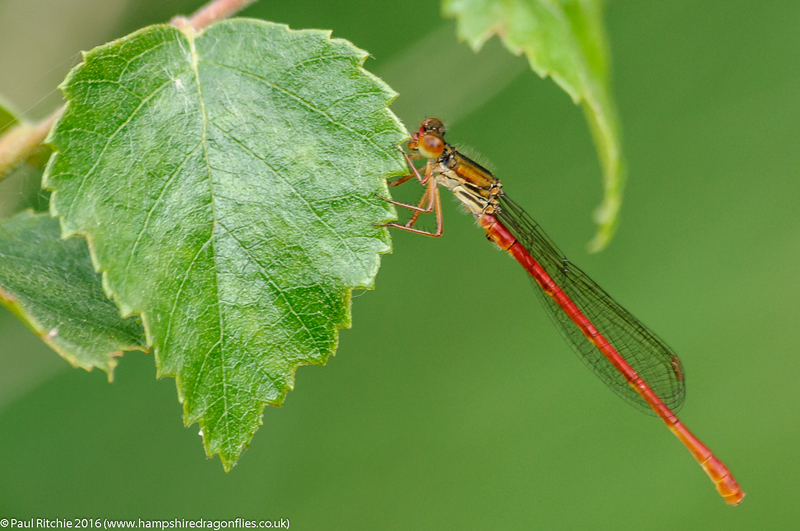 I was hoping for Small Red, Southern and White-legged damselflies, some Keeled Skimmer and if lucky a Common Darter or two. 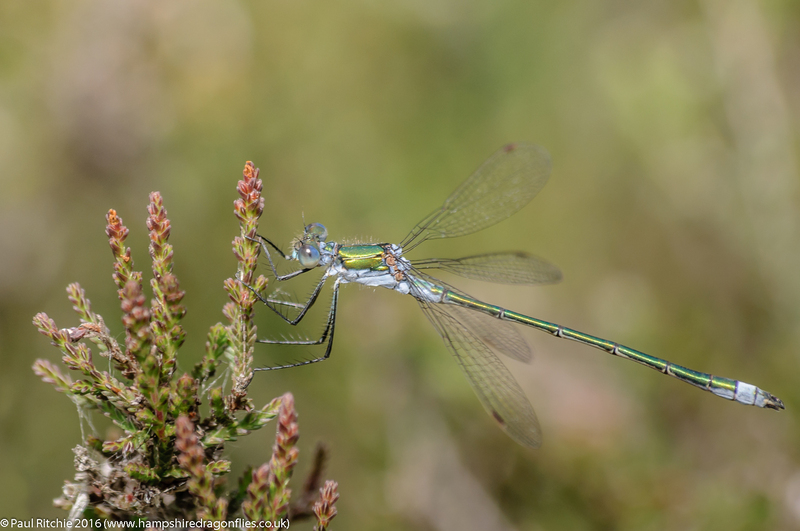 At Puttles Bridge the first of these was in the bag with a good selection of Small Red among the Bog Myrtle. 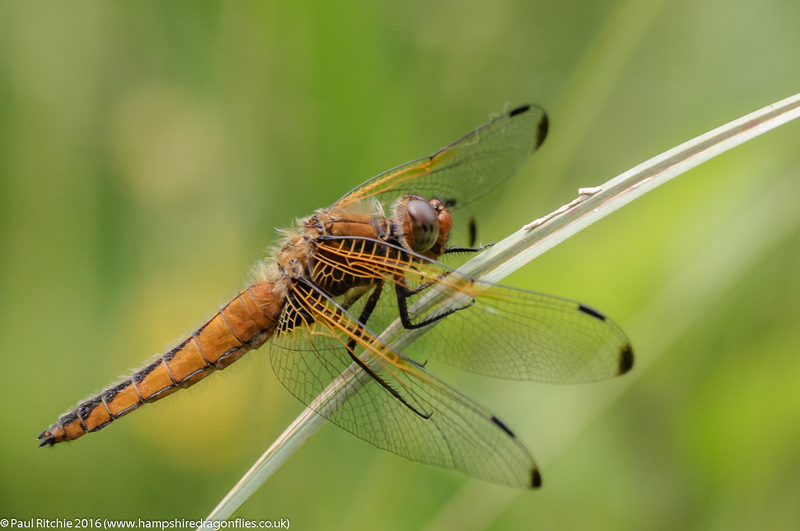 Shortly afterwards the first of the Keeled Skimmers made an appearance. Every season I forget where the first stream crossing is, so I spent a few unnecessary moments tangled deep in the undergrowth or navigating bog. I found it in the end though, and made a mental note to take the easier option next time. 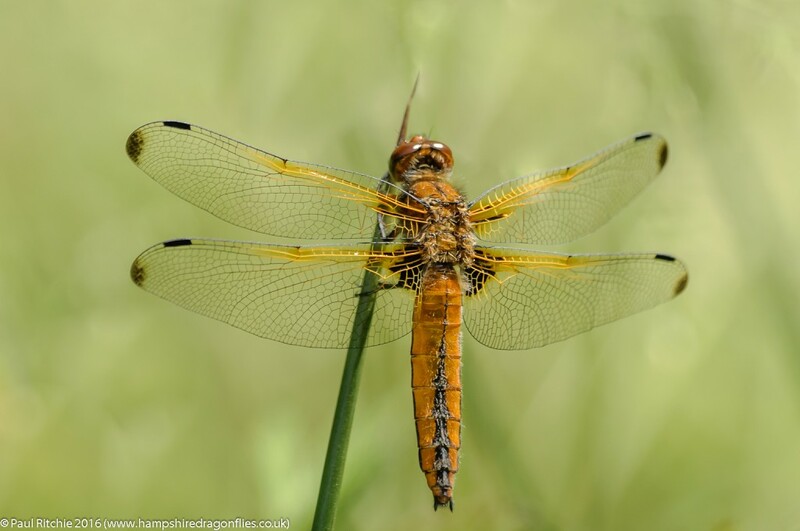 Across the stream the open clearing had a Broad-bodied Chaser joining the Beautiful Demoiselles, but no sign of any patrolling Golden-ringed. 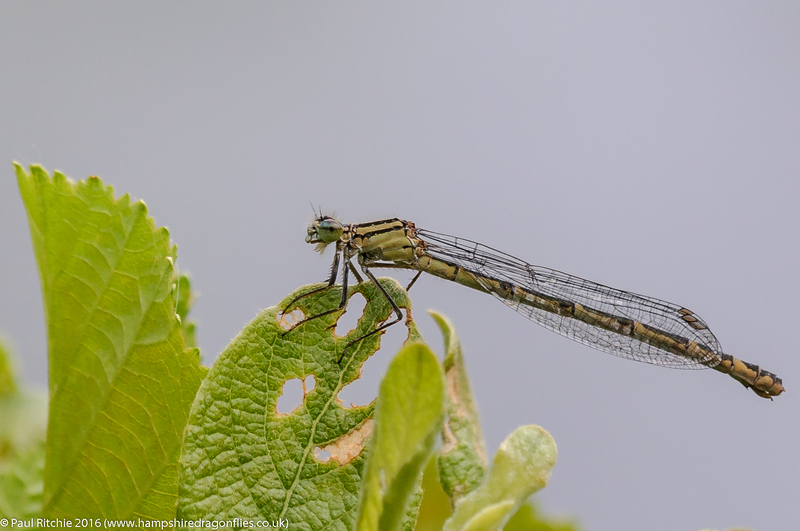 Likewise at the next crossing, but at least the first White-legged and Southern damselflies made an appearance. It is still a little too early for Ober Water to reveal its magical charms with activity over water very sparse and punctuated. 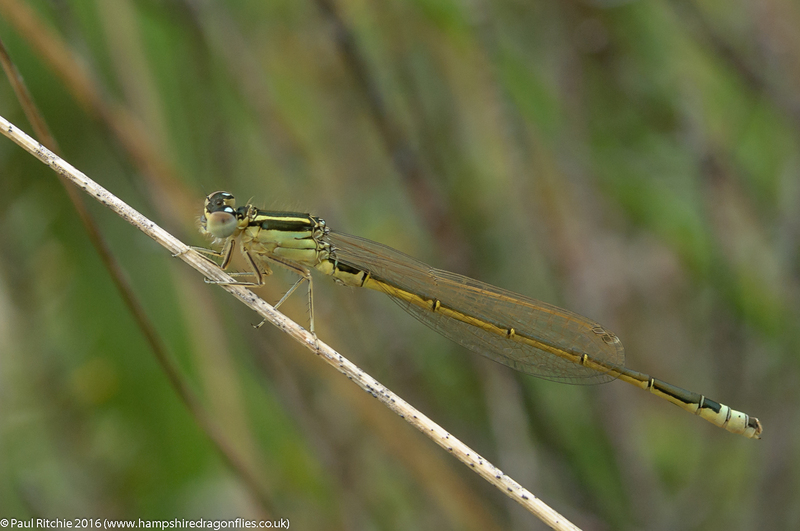 The usual hot spots contained no more than a couple of each damsel species; mostly males determining territories. 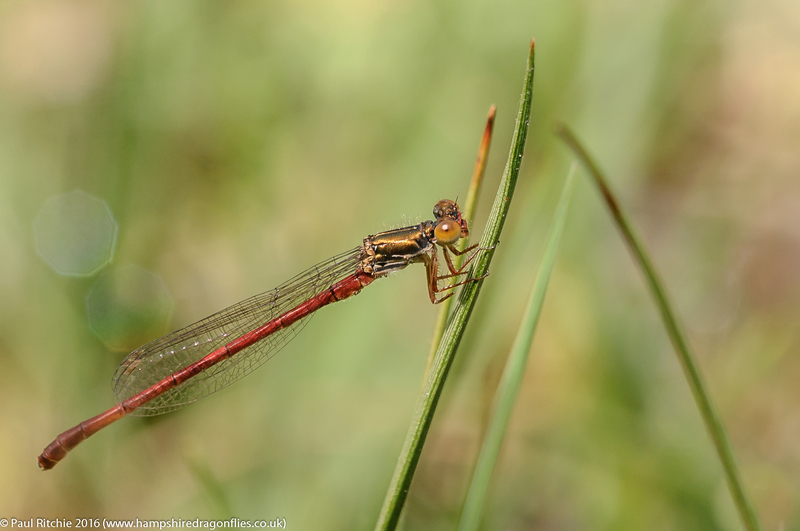 Likewise the heath didn’t produce the spectacle of hundreds of teneral Keeled Skimmers and the grasses were host to only a few immature damsels, mostly females avoiding too early attentions from the males. As such photo opportunities were limited and I completely failed to get a worthwhile shot of any of the White-legged, but there’s plenty of time. 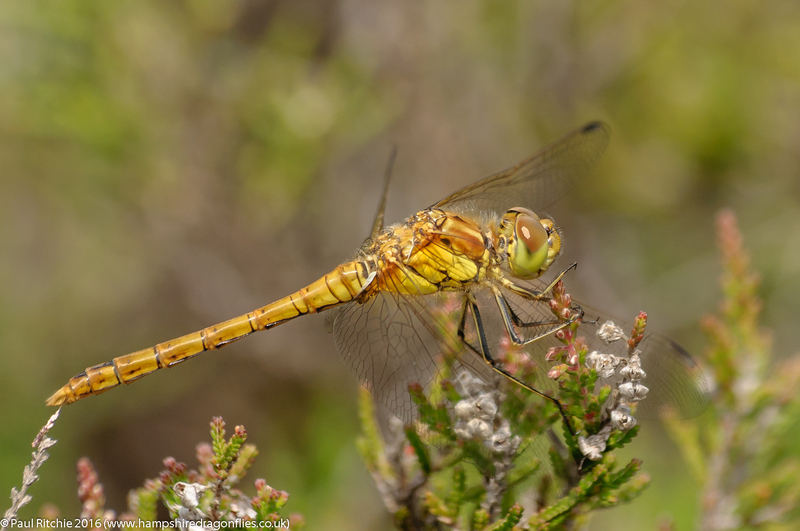 Likewise the Common Darter, of which three teneral individuals were disturbed while walking he paths across the heath. 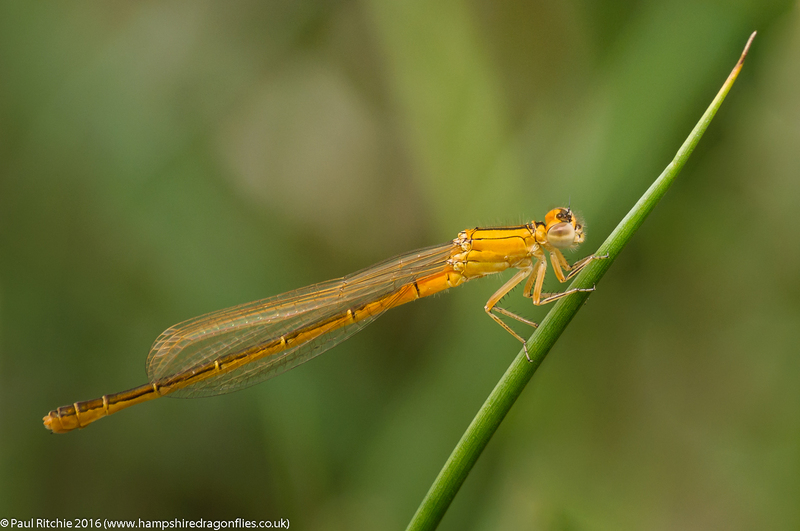 I was more than happy with adding five to the species count and a walk along my favourite New Forest stream. I do have a few commitments and requirements throughout the remainder of June given the next spell of good weather, but I’m looking forward to coming back to Ober in full bloom. 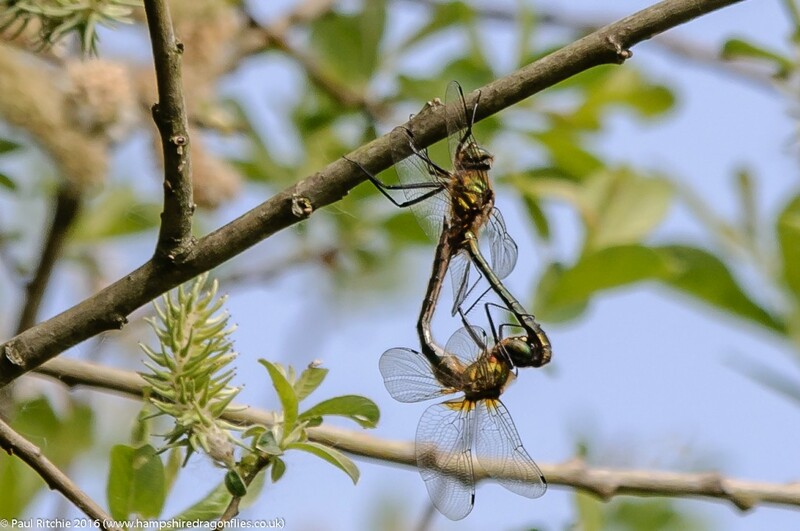 After the excitement and associated pressure of Whixall Moss I needed to reconnect with odonata without the distractions of being part of a group, no matter how enjoyable the company. Maybe it’s peer pressure or a higher threshold of satisfaction, but I didn’t feel I performed at my best and came home with a shot of the day. Or maybe I’m being too self critical! No matter, there will always be another chance. I took a couple of days rest to reflect and calm down before needing to get out on my own on Wednesday, and as I haven’t been for over a week I naturally chose Bramshill. I’m determined to visit at least once a week to get a feel for this magnificent site and compare it to last season, and so far it continues to impress. I wasn’t blessed with the best conditions on arrival, and checking out the small ponds might have been a tad premature considering the lack of sun, although it was hot and humid. 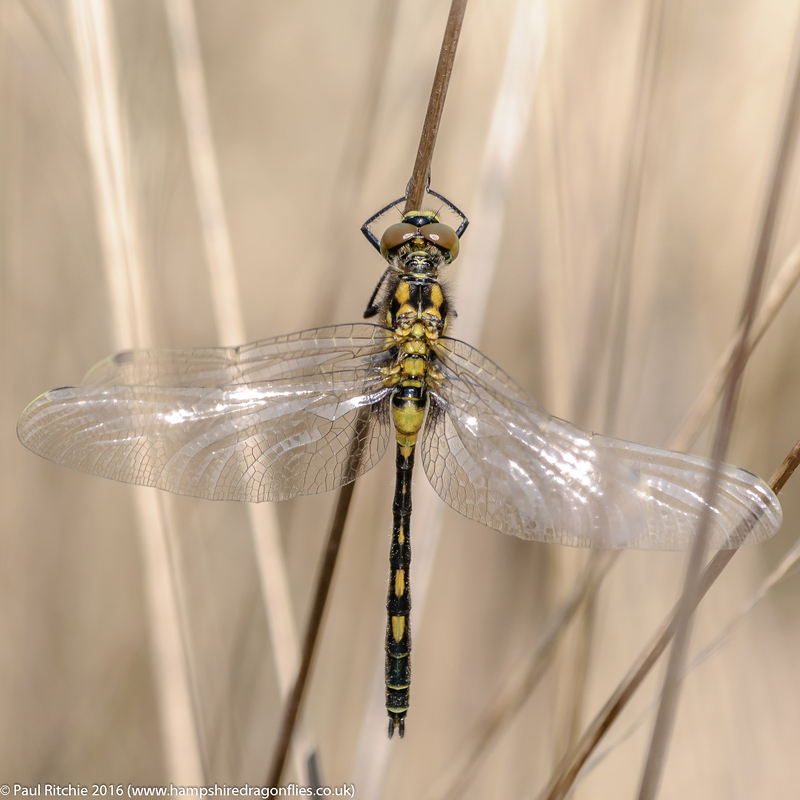 Nothing but a few damsels testing the waters, but I did find a roosting Emperor. Not the most comfortable conditions to embark on a walk, but as over-water activity is minimal in such conditions it made sense to do a little foraging. Hawker Alley didn’t throw up the wished-for perched Downy and the main rides were mostly lacking. 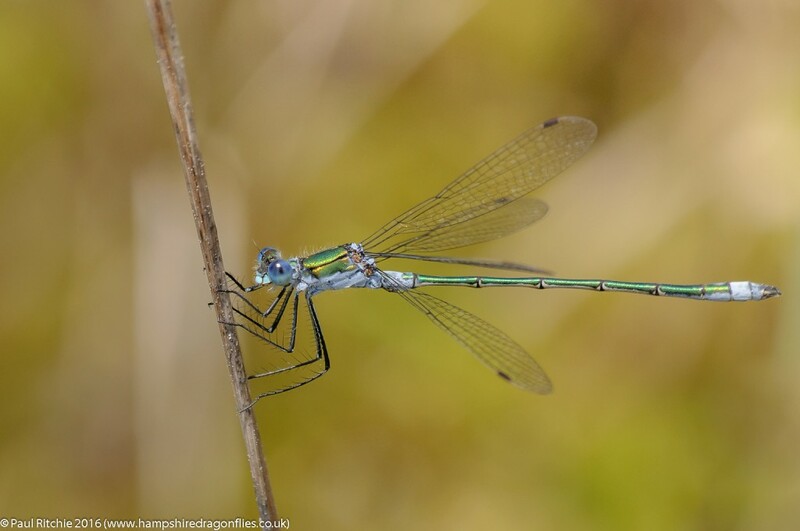 Once I’d reached the other pond things improved with some Blue-tailed and Common Blue decorating the grass fringes, and it was here I encountered a beautifully-fresh and not long emerged male Emperor, resplendent in his immature colours. 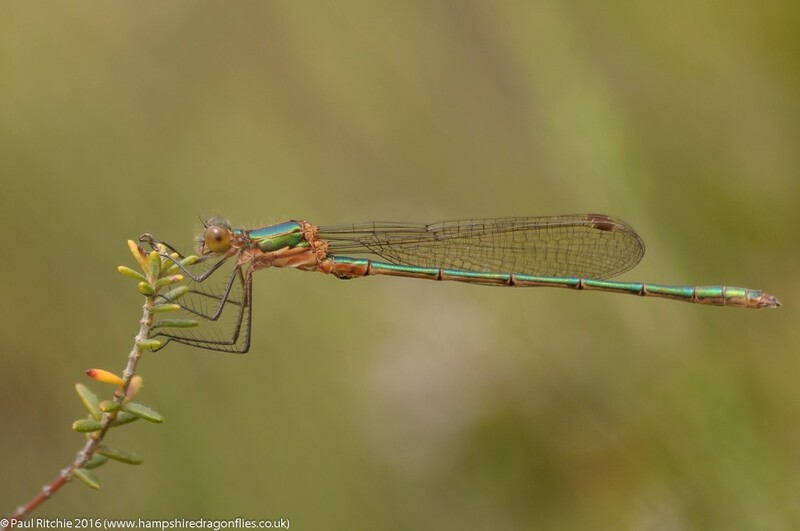 A little further on is a triangular clearing with a small stream running through, a couple of displaying male Banded Demoiselles flew above while down in the scrub were a selection of damsels and another Emperor. I find the surrounding grasses are usually better for photo opportunities. 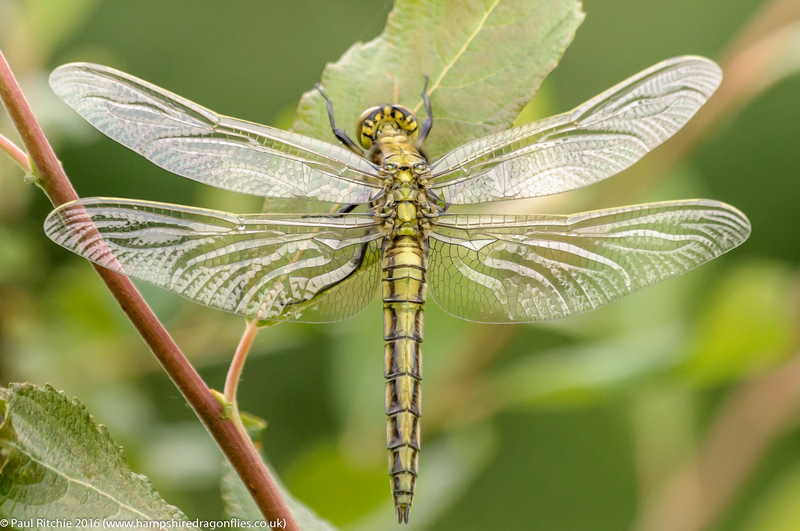 The walk back to Long Pond was mostly uneventful and the sun was trying to break through The waterside had come alive with Four-spotted Chasers, a few Downy and a couple of Emperor joining the hundreds of Common Blue, Red-eyed, Large Red and Azure. The tenerals were still rising with most following the updraft into the canopy, but occasionally one would take the nearest option. There were a few more Emperors patrolling with the arrival of a sunny spell, and naturally I had to engage a little. 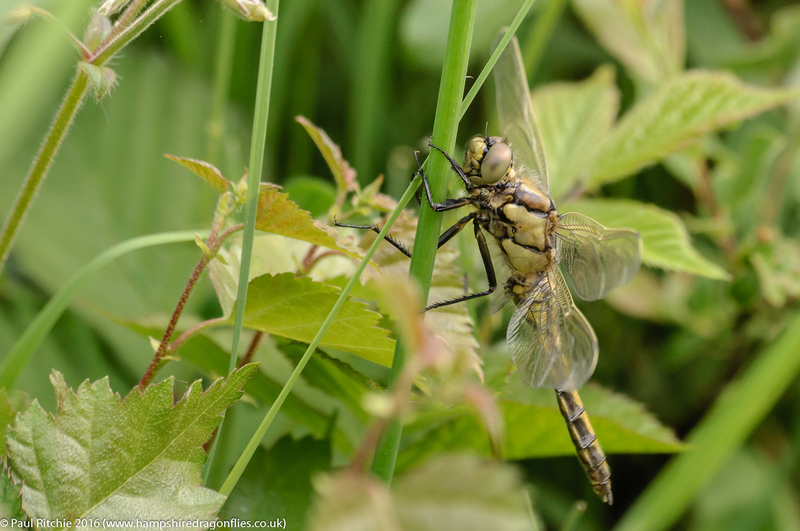 A final check of the small ponds produced mainly Four-spotted Chasers and a selection of damselflies. 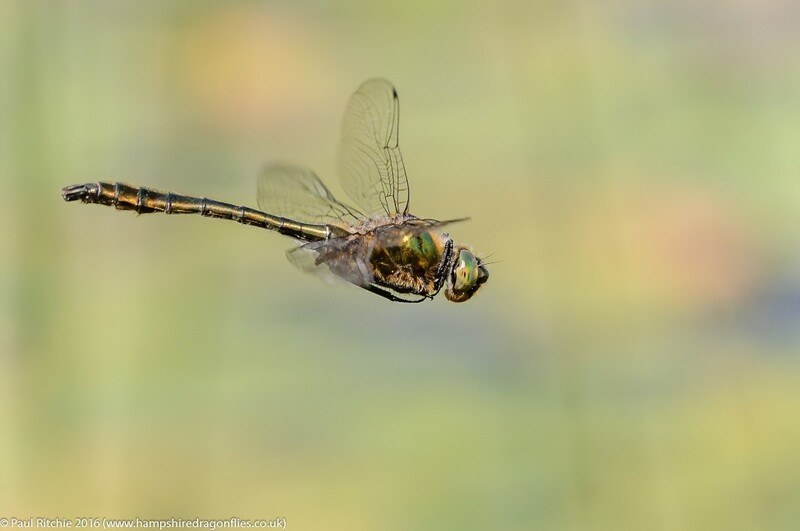 No Hairy today, which means that they’ve passed their peak but no doubt there will still be a few stragglers around until the end of the month when the Emperor reins supreme and the Brown Hawker will provide more than a welcome challenge. 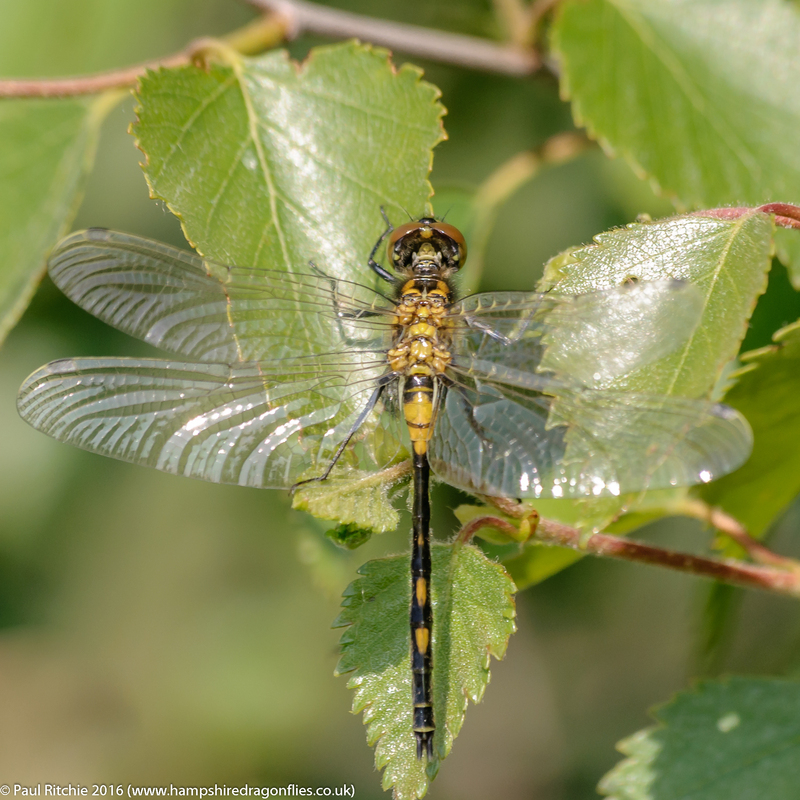 Towards the end of the season last year Marc Heath and I arranged a trip this June to visit Whixall Moss in Shropshire, a site with a healthy population of one of the UK’s rarest species, the White-faced Darter. 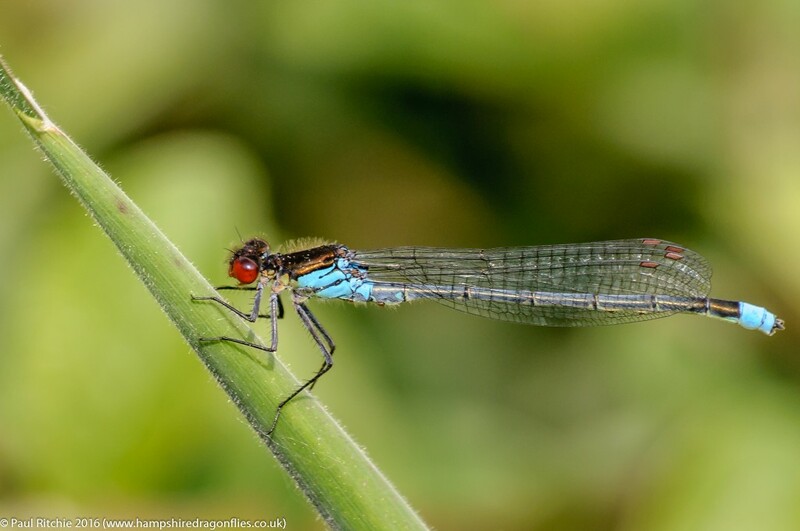 The advantage of Whixall Moss is you are more or less free to enjoy them at your leisure without the time and other restrictions offered by the organized trip to Chartley. However sourcing reliable information can be tricky, with a few individuals prepared to send you on a wild goose chase. Not this time though; we’d done our research. Armed with this knowledge we didn’t waste any time sourcing the key pond with maximum enjoyment. It was certainly a sight to behold, and once the sun had finally broken through the low cloud the pool came to life spectacularly. At least two dozen males, half-a-dozen females and several pairings they certainly offered us a choice of opportunities, even if most of them were frustratingly at ground level or facing in the wrong direction. We couldn’t have wished for better weather with temperatures easily in the mid-twenties, which made me question the climate-change excuse for their rarity. If they can survive – indeed thoroughly enjoy – such hot and dry conditions I see no reason why they cannot be reintroduced to the south. 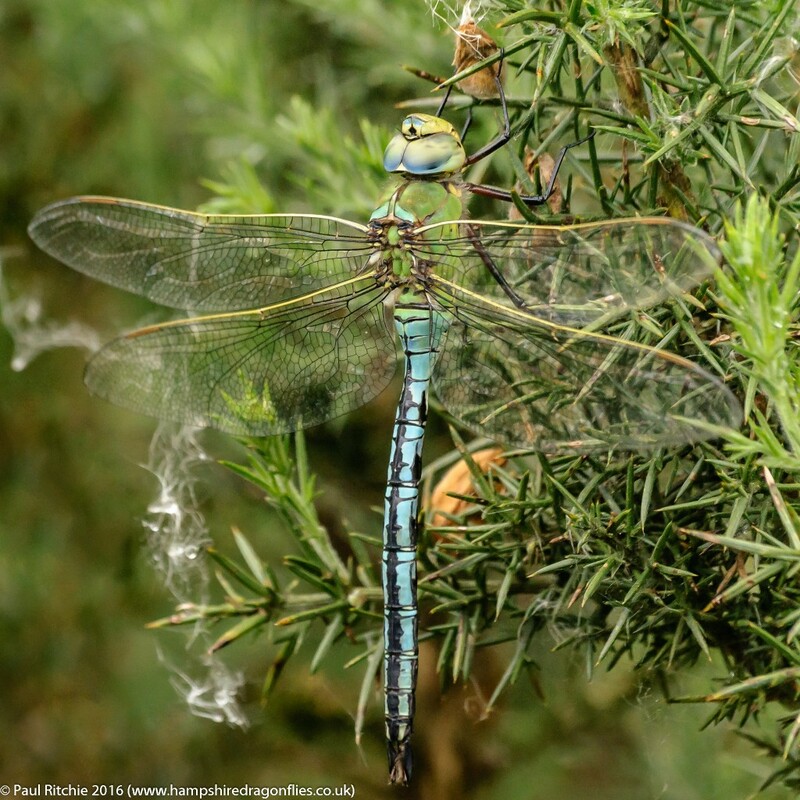 The New Forest and surrounds in particular have more than enough ideal conditions for them to thrive. 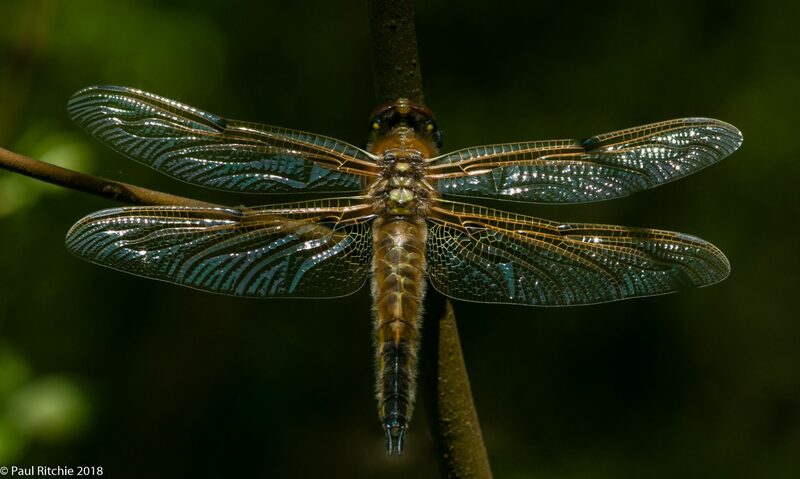 After the White-faced Darters the most prevalent species was the Four-spotted Chaser, who the former had no trouble standing up to. 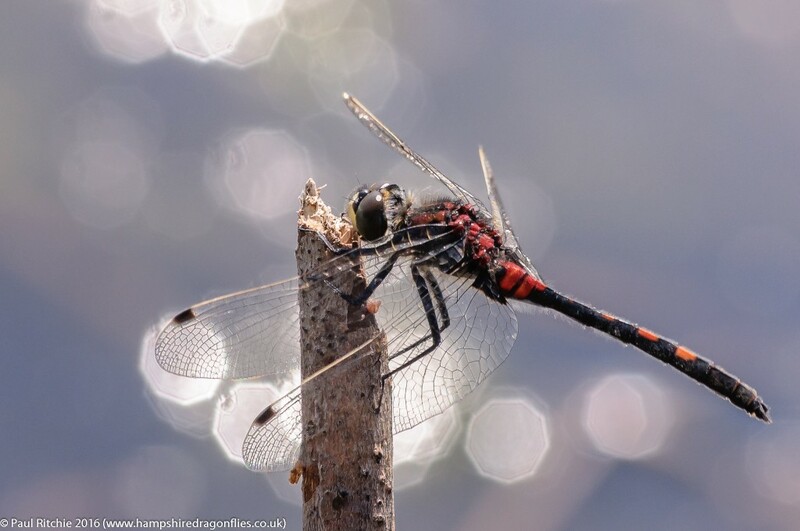 A lone Emperor was seen patrolling the paths briefly, but otherwise the only other species present were Azure and Large Red, although we did have a lone Blue-tailed on the way out. It’s difficult to believe that six hours can pass so swiftly, and by 4.00pm we were all feeling a little flagged and with a long drive home we reluctantly called it a day. We witnessed about as much as you could possibly expect for a single species with fabulous over-water activity, battles and pairings. 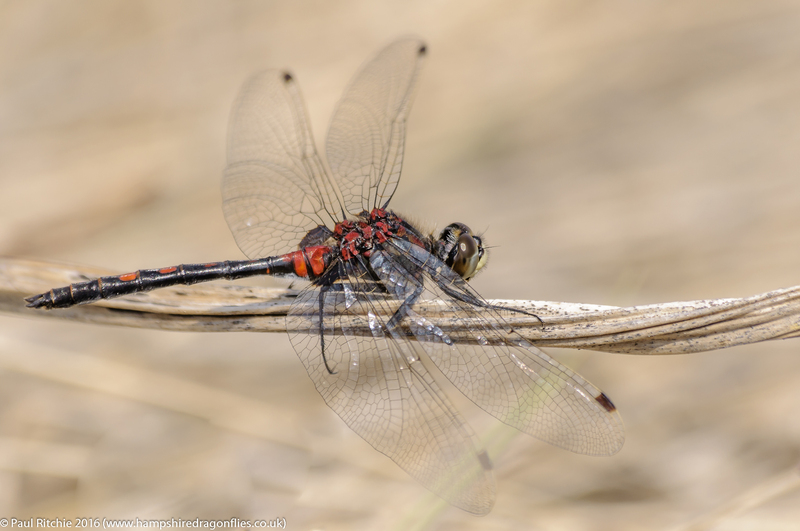 Emergences were still going on late in the afternoon and, contrary to popular belief, this isn’t unusual in Darters, Skimmers and Chasers. I finished a tiring yet fulfilling day with a classic ‘stick’ shot, albeit against the sun. There are several projects underway to reintroduce this charming species to other sites. They have already been successfully introduced to South Cumbria and the Delamere Forest and as I write I hear about the possibility of Crowle Moor in N. Lincs. Thursley Common will probably be in line as this previously held a population, and I for one hope the New Forest and West Dorset are considered. A long drive to be sure, but with good company and plenty of action it was well worth it. On Saturday we decided to introduce Doug to the delights of Bramshill Common. We were barely at the pond when he immediately busied himself with a patrolling Downy. 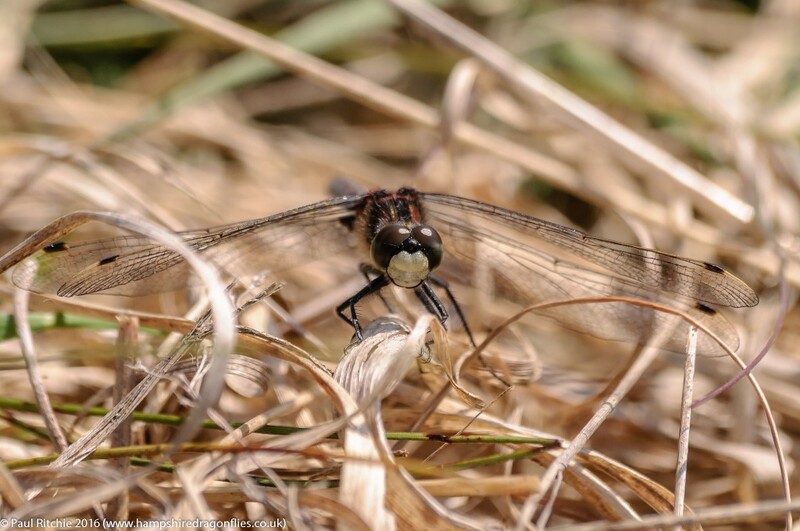 The southern shore was alive with tenerals, including Four-spotted Chasers, Black-tailed Skimmers and swarms of Red-eyed and Common Blue. Once I’d managed to coax Doug away from being rooted to his spot, we took a stroll along hawker alley, stopping frequently to check along the shoreline. 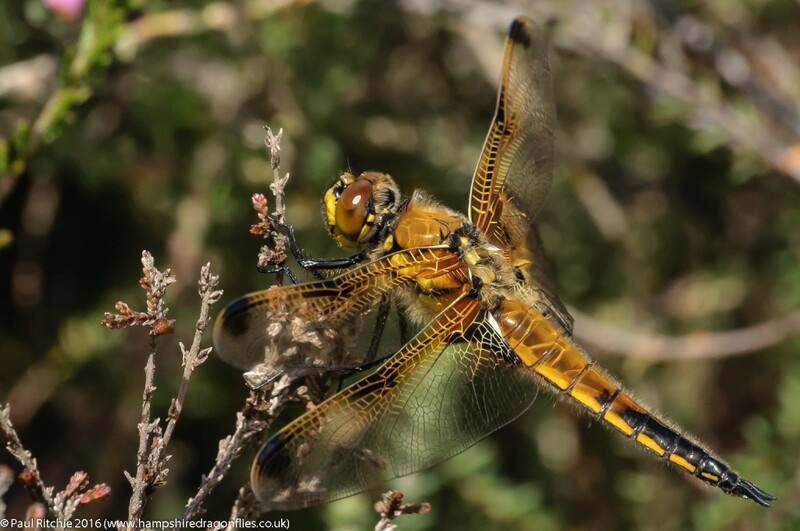 Plenty of Downy and Four-spotted Chaser battling for supremacy close to shore and every footfall would see another teneral rise to the canopy. 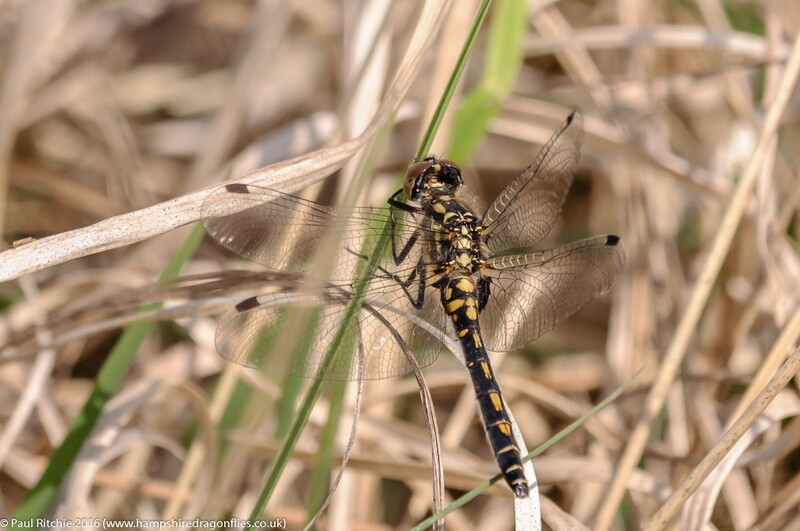 We took stroll along the main track to the crossroads and had our first glimpse of a male Emperor circling the clearing, shortly followed by another. 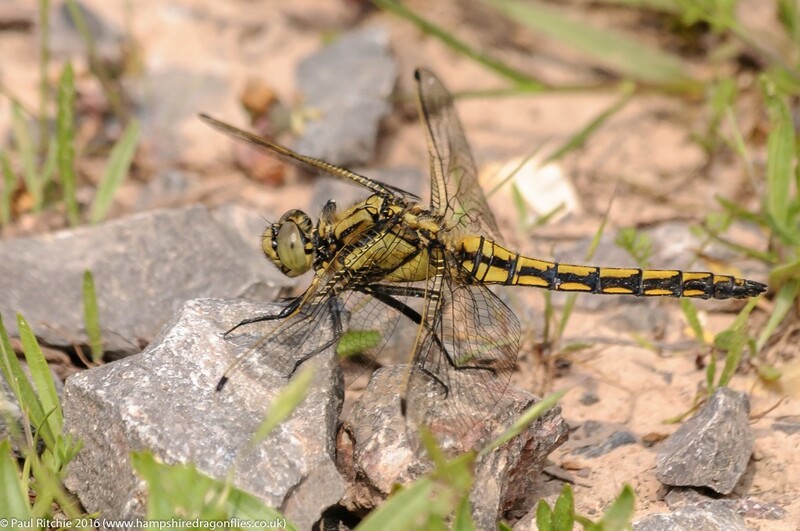 We watched while we lunched hoping either would perch, but fresh wings and hunger kept them airborne, so I attempted to coax a young Black-tailed Skimmer off of the ground, but he wasn’t having it. Back at Long Pond Doug continued with the Downy while I attempting to tackle one of the dozens of male Red-eyed along the fringes. 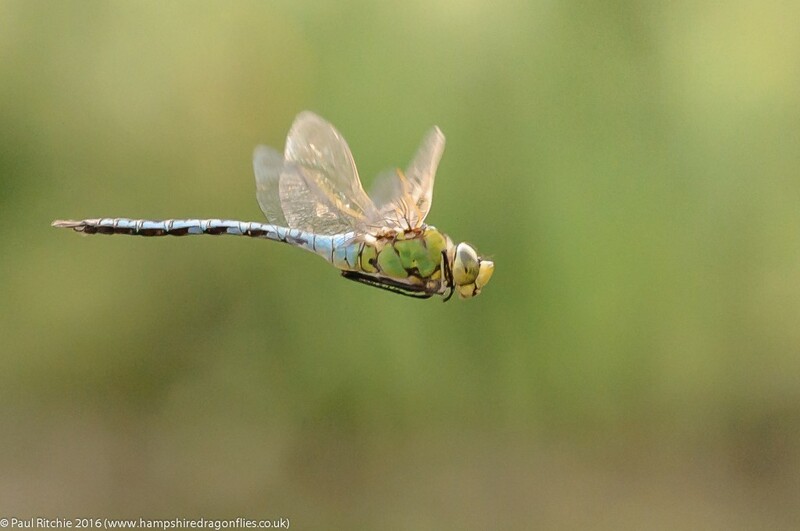 They have to be one of the more frustrating damsels; just when you think you have them in your sights, off they go again. Concluding the day with another walk along hawker alley we found a mating pair of Downy perched several meters up a tree. We couldn’t have wished for a better finale, but the weekend wasn’t over yet. Sue & I returned to Bentley Wood on Sunday, and what a difference a week makes! Barely into the woods and we were greeted by a beautifully-fresh female Emperor who rose at our passing. 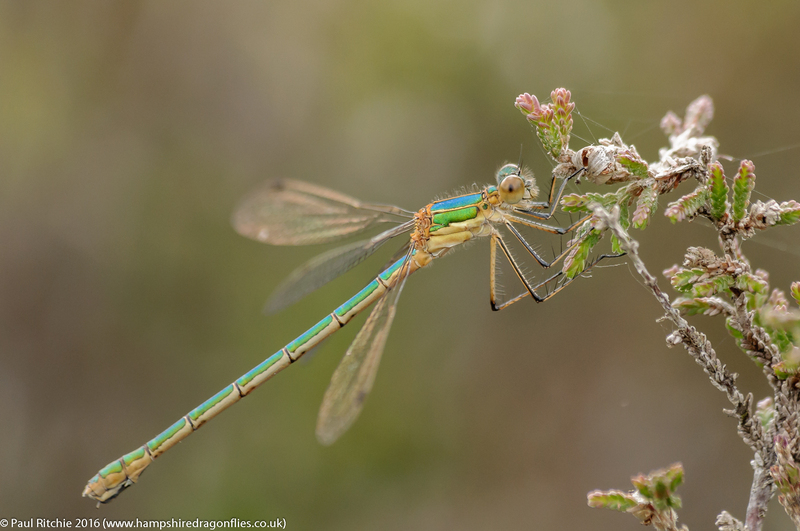 She circled and took refuge deep in the scrub, so I decided to concentrate on those beautiful fresh eyes. At the pond we were treated to a Downy motherlode. What a sight! 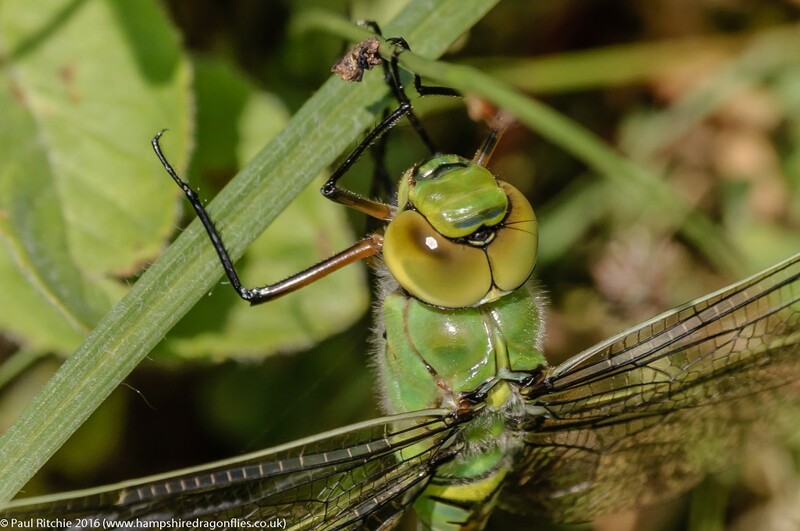 Up to seven males patrolling with five at any one time, females ovipositing and no less than six pairings. Four of these naturally headed high to the canopy, but the other two chose to perch low in the scrub not far from water. A nightmare to approach and as nervous as paired Emperors, so I couldn’t improve on yesterdays. The patrolling males were extremely difficult to photograph, wizzing by at great speed without the slightest pause and occasionally engaging in fisticuffs with rivals All very non-aggressive compared to most species. 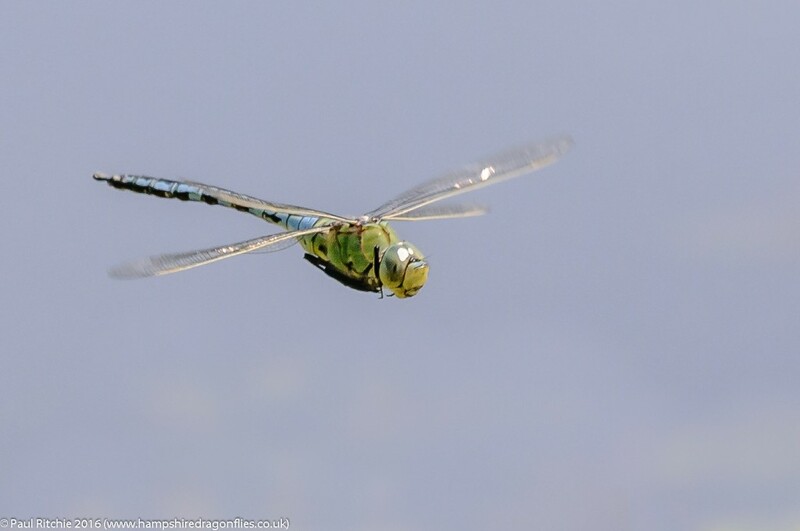 A little later we had a young male Emperor come in to test his flight muscles. That should keep me going until summer returns.